We’d love your help. Let us know what’s wrong with this preview of Gabriel's Demons by Tori Centanni. My name is Gabriel Price, and I’m no stranger to bad dreams. After losing my family in a house fire, I suppose it’s normal to have nightmares. Except now, I’m dreaming awake, seeing things I don’t want to see, things I shouldn’t be able to see. The first time I saw someone’s death, the vision hit me hard, just like the speeding car that crashed, killing its driver. There wa My name is Gabriel Price, and I’m no stranger to bad dreams. The first time I saw someone’s death, the vision hit me hard, just like the speeding car that crashed, killing its driver. There was nothing I could do to stop it from happening. Not the first time. Or the second. Or the third. But now…I think I might have a chance to prevent my visions from coming true. To ask other readers questions about Gabriel's Demons, please sign up. I received this book in exchange for a honest review from Lovers of Paranormal. This was a lovely introduction to Gabriel, who I know will be in the next installment of this series. Another teenager who suffered a tragedy but manages to continue on with his life. I love that he was aware of the financial situation/burden with his Uncle and was willing to help. It was once again very realistic and relatable. Tori is an amazing storyteller. 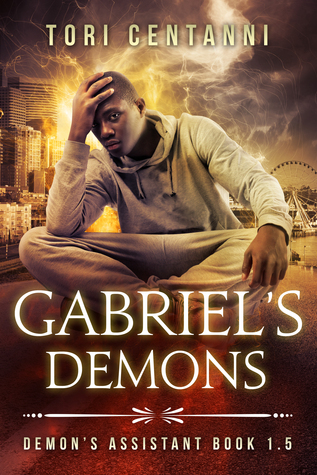 Why I read it: A little while ago, I took part in a blog tour for the second book and I was also given Gabriel's Demons to read, as it's a novella that brings the two books together. I read it prior to reading In the Demon's Company and I think it made the story that much richer. My Thoughts: I really liked meeting Gabriel in his own little story, it gave me some I received this book for free in exchange for an honest review. This does not affect my opinion of the book or the content of my review. My Thoughts: I really liked meeting Gabriel in his own little story, it gave me some background for when I jumped into the next novel. Without it, I probably wouldn't have liked Gabriel as much as I did, as he does come across a little stand offish when we meet up with him again through Nicki's eyes. Gabriel helps Azmos with his work, as he is unable to hold down a regular job due to his visions. The visions he experiences are so detailed, you're watching them along with him. I almost couldn't believe that this novella was only 50 pages long, as it contains such a complete story. You can't help but feel for the poor guy, as these visions are not something he wishes to have. As well as Gabriel, we also meet Myron who is another demon, different to the ones that we have encountered before. Tori Centanni really has created a wonderful universe with this fun little series. All of the characters are unique and they read as real, at least, to me. I believe in them, and I have no doubt it's because of the great writing that is able to leave such an impression with so few words. I received this book for an honest review from Lovers of Paranormal on Goodreads. After a puzzling start on the first book in this series, I really liked this book. The premise is the same, after being saved from certain death, Gabriel now has the ability to see someone's death in the future. It's more of a curse though, as these visions cause him to black out like seizures and can come on any time of the night or day. He desperately needs a job but who will hire him? I loved that he is a tall bl I received this book for an honest review from Lovers of Paranormal on Goodreads. I loved that he is a tall black teenager and so not what is typically portrayed. And the fact that he's gay is the icing on the cake for me. Whilst trying to seek help in the paranormal section of a bookstore he meets a man with shocking pink hair (and eyebrows) who offers to help and he is drawn to him. Finally, someone to help sort out the mess his life has become. Or is it? Read the book to find out! Thank you Tori Centanni the opportunity to read your book. I was given this book in exchange for an honest review LoP (Lovers of Paranormal). This short novella answers a lot of questions posed in in Demon's Deadline book 1 of the Demon's Assistant Series. Gabriel's Demons follows the plight of Gabriel Price, his efforts to come to terms with the death of his family, trying to make a life for himself, and his debilitating visions. The author was extremely descriptive at detailing Gabriel's vision Thank you Tori Centanni the opportunity to read your book. I was given this book in exchange for an honest review LoP (Lovers of Paranormal). Though a shorter 'novella', 'Gabriel's Demons' packs a lot of punch within its pages. Gabriel fills in a lot of the unknowns left over from Book #1 of The Demon's Assistant series. His skills are a major burden to him but they are very valuable to the demons, in more ways than one. He also adds a lot to Book #2 of the series (not available at the time this was written but read by me as an ARC) and also becomes a good friend and much-appreciated ally to the main character, Nicki. This is #1.5 of T Though a shorter 'novella', 'Gabriel's Demons' packs a lot of punch within its pages. Gabriel fills in a lot of the unknowns left over from Book #1 of The Demon's Assistant series. His skills are a major burden to him but they are very valuable to the demons, in more ways than one. He also adds a lot to Book #2 of the series (not available at the time this was written but read by me as an ARC) and also becomes a good friend and much-appreciated ally to the main character, Nicki. This is a standalone novella in the Demon’s Assistant series. It’s a quick read and I really liked it. The descriptions about Gabriel’s visions are so detailed, I can picture what he is seeing clearly. When I went back and saw that this book is less than 50 pages, I was surprised. There is a lot of story in this novella! This is a really cool series with a twist on demons. I definitely recommend this book and the series! Tori Centanni is a nerd girl and a recovering goth. She likes dark, quirky stories with elements of humor. When not reading or writing, she can be found baking, watching too much television, and wrangling cats. She lives in the Pacific Northwest.